I have had many paranormal experiences since I started listening to the Coast to Coast AM radio show in December, 1994. So much has happened to me since that time that I shudder to think of how much writing and artwork it would take to explain it in its entirety. I cannot help but wonder how many others are in that same situation. I say this because the number of other people having paranormal experiences has been on a massive increase since the 1990's. The photographs of the rods (as seen on the first page of this website and the photo gallery) were an early spark to my awakening. Those early photos were documentation and proof enough for me that the "paranormal" is a very real thing! That is in addition to some other personal sightings and experiences in the mid 90's when I had an outdoor guard job. More serious experiences would begin for me in late 2001. It is rather difficult for me to say if the things that have happened to me over the years since 2001 are more good than bad! But, I have learned why some people who come into contact with the paranormal end up killing themselves (Yep, for some, it's been that serious!). This is clearly not a good thing in many cases. For my own part, I had come into contact with considerably more than I had bargained for. ...oops! I get no joy out of saying that the "end time" is a REAL THING! In so saying, I don't mean to imply that this is going to be the end of everything. That's somewhat of a digression from the theme here on this page. For some more expansion on this issue, please see my "Very Bad News" page on this website. One of the tell-tale signs of this impending "limited end time" is that paranormal activity appears to be very much "ramping up" on a worldwide scale in parallel with the all the other odd events, be they weather related, war related, New World Order related, UFO's, etcetera. It should be clear by now that "sides" are forming. You will end up either aligned with the proverbial "angelic" or "demonic" forces. This by itself would be a very long discussion which I can't hope to cover here. In any case, it seems to me that there are still too many people ignoring what is going on behind the facade of the fake reality projected by the Government and its lamestream media mouthpieces. From what I have seen up to the present time it appears that most people will just sleep walk off of a cliff rather than wake up. There may yet be hope ...but who knows? Yes, I do know about the New Age "oneness" stuff, and all the song and dance that goes with "just getting along". I tried adopting some of the "New Age" nonsense, but it didn't work out. Once you discover that even the vaunted ET/Aliens are engaging in occasional hostilities with each other then it should become immediately clear that "getting along" is going to be even more difficult at our lesser developed level. Even if you are a mere dabbler in the genre discussed on this site, then you need to know --if you don't already-- that most everything nowadays is either infiltrated or completely controlled by Government intel agencies somewhere along the line. This is something that would take several websites to go into in any real detail. For those who have doubts, it should be no trouble to find any number of websites that go into these issues in more detail, so I don't repeat much of that here (try http://www.infowars.com/ for starters). In my own instance, I can attest to having had many years of experience with these kinds of problems. By the way, when I identify the Government with the capital-bold face-underlined G, what I mean is the "secret" or "shadow" government as opposed to the normal everyday government that you see publicly. The real Government, the ruling secret government, is our worst enemy! I may also use the term "ReGime" interchangeably; it has a more sinister sound to it. Many other writers have picked up on this new term when the lamestream Government media mouthpieces started branding certain other governments, "the regime". In my studies over the past dozen years or so I have found that virtually EVERY CONSPIRACY you ever heard of is ONE HUNDRED PERCENT GRADE "A" REALITY! ...at least to one degree or another. They aren't mere theories anymore! Best of luck to you in any case. In my particular case, I have spent the past couple of decades doing a lot of moving around from place to place. My moves since 2001 have had much more to do with the paranormal and pending events than any other reason. I'm originally from Columbus, Ohio, but a certain event occurred in early 2006 that changed my situation and it resulted in my moving from Ohio to Las Vegas. I made a few trips back and forth to Ohio since that first long stay where I made Nevada my new home state. I am now in Nevada, but I may flee AmeriKa this year ...not sure right now. While I didn't really accomplish much during that first long-term stay in Las Vegas, I did manage to take a number of video clips along the way to and from Las Vegas and a few other places. However, it would not be clear until December, 2007 that I would discover that on many video clips I managed to capture some extraordinary things in those videos; namely, something I call "spybees" (another term might be "telemeter discs"). I have considered publishing some of these video clips, but other things seem to intercede, so I never have gotten around to publishing any of these clips after all these years. The original purpose of taking these video clips was perhaps to make a travelogue video. It wasn't intended to be anything particularly spectacular especially when one considers that these videos were taken from such a small device as an Aiptek video camera shown below. I upgraded to the higher quality Fuji camera (shown below) in 2009. When I came back to Ohio later in 2007 I found a house sitting job for several months in Athens, Ohio. This is where I got my initial indoctrination into taking still photos with the flash in an attempt to find orbs! I did indeed find them along with some other strange phenomena! Many of my best paranormal still photos came from that Aiptek camera in 2008 to 2010. The batteries have since wore down, and they are too expensive to replace, but I think I have a workable replacement that will be even better. It's just that these kinds of projects take time, and I have so many projects. That's all another long story. My Aiptek camera (above) was my old former workhorse. It's now largely in disuse because of the battery. I may try to do something about that later as it took some of my best orbs photos. It does 30fps video, still photos, and can record video in its DVD mode. This tiny camera does take rather good stills. The resolution of the Aiptek camera can be set at 6 megapixels, 3 megapixels, or 1 megapixel. Pretty good, given its size. 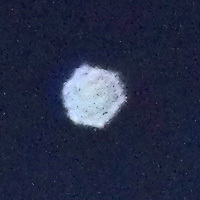 Most of the paranormal photos that were taken with this camera were at the 6 megapixel setting. In April, 2009, I acquired a Fuji S1500 camera. You may notice that it resembles the 35mm SLR's of old. It does almost all of the things my Aiptek does and there are considerably more detailed options when taking still photos (It also cost considerably more!). The resolution of this one is up to 10 megapixels, and it also has x12 optical zoom. This is now my primary camera. It takes 4 AA batteries, and it can use them fast, but at least it can be kept powered continuously without the disruption of recharging the more expensive lithium batteries. This Kodak Easy Share camera was purchased in March, 2011. The advantage of this camera is that it's small but can still take AA batteries. This means it's a lot easier to keep the camera powered; but it does use batteries fast like the Fuji camera above. I have taken many para-photos with this camera since in addition to normal photos. These cheaper cameras pick up as much (or more) paranormal phenomena than any of the more expensive cameras. It also has many of the extra abilities that the Fuji camera has and up to 12 megapixels, but it's only x3 optical zoom. This camera was about $60 if I remember. It has worked out very well, but each camera seems to have their own particular quirks when it comes to imaging paranormal phenomena. As of early 2013 I had used this camera so much that the flash has quit working and the plastic holding tabs to the door to the battery compartment have worn out and I am now holding the door shut with DUCT TAPE! This camera has endured a pretty severe beating. Just above the hilltop on the right side of this photo (arrow pointing) is a dark object which was unseen by me at the time this photo was snapped on April 6, 2007. The second one below was snapped perhaps 10 to 15 seconds later. While the object may appear to be an insignificant fuzz ball, these two photos represented the only stills that I had at that time of objects I would come to term call "spybees". These may be the same thing as "telemeter discs" as described by the Plejaren ET's. "Spybots" are yet another term. It would be a few days later I would discover some video taken with the Aiptek camera this same type of object zipping around my car as I was driving. I would come to discover dozens of video clips of the same type of object since that time AND from the whole year prior when I first moved out to Las Vegas (I was there for nearly a year, mid-2006 to mid-2007). I guesstimate that these spybees are perhaps about the size of soccer ball, give or take. 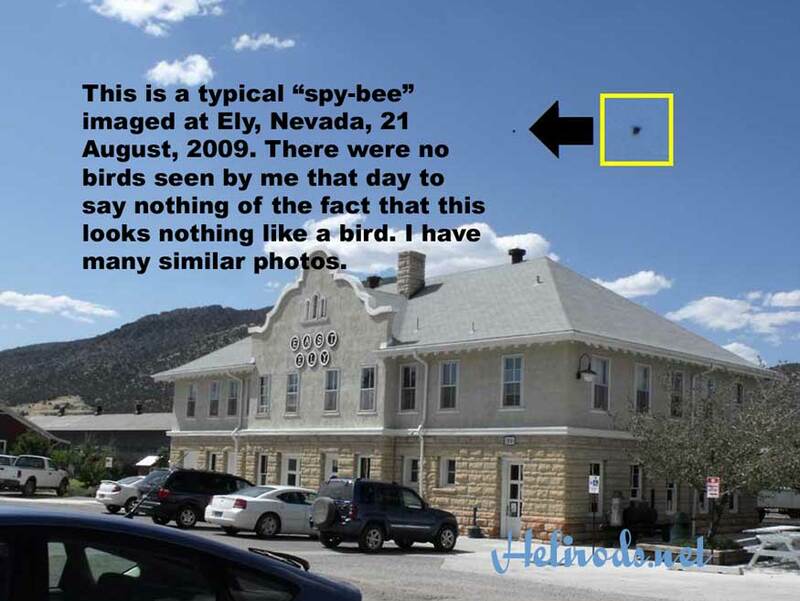 The same seems to be true with many of the spybees I have captured on video and in still photos to date. So far as I can tell, the spybees that I now know to have been following me everywhere are NOT a product of "our" secret Government (our ruling Lords and Masters). Rather, they are almost certain to be of alien origin and not entirely mechanical in nature (bio-mechanical?). I strongly suspect that these things are controlled by what I would very loosely term the "Angelic" forces. I have powerful reasons for believing this, but that would require very long dissertation. During 2009 and afterwards I would capture many fascinating images with the more complex Fuji camera. One example is posted further down this page, and there are many others in the Photo Gallery. The photos to the left are merely a few of MANY such photos taken while I was living in Athens, Ohio for a short time (from Nov '07 to Sept '08) . 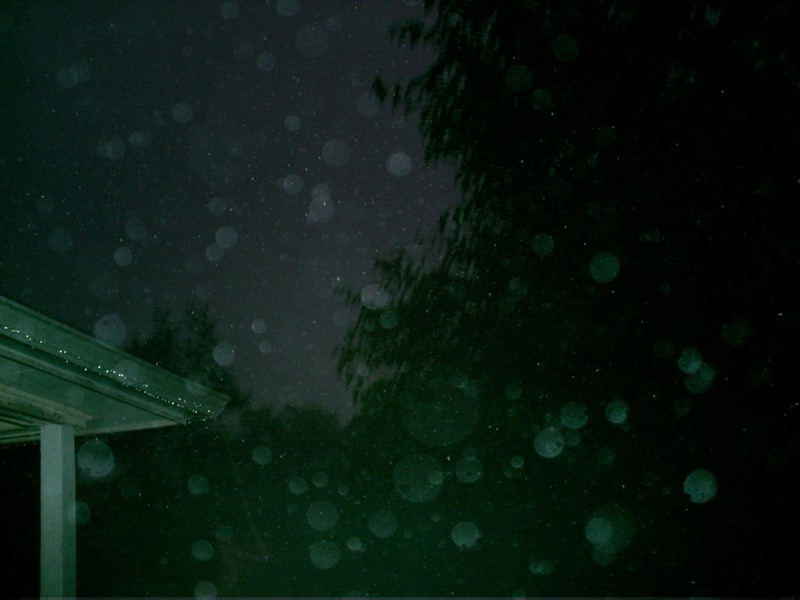 There are a few other Athens Storm Orb photos in the photo gallery. These photos were taken from the covered front porch of the place I was staying at the time. Wherever I go, the orbs follow. I continue to get major amounts of orb activity. You might also like to know that the subject of orbs comes in for very high priority diss by the Government. The top image (at the left) is the photo as-is (except that they have been lowered in quality to get the file size down). The "purplish" looking version below is from the originals are color inverted. This often makes the orbs show a tad better. 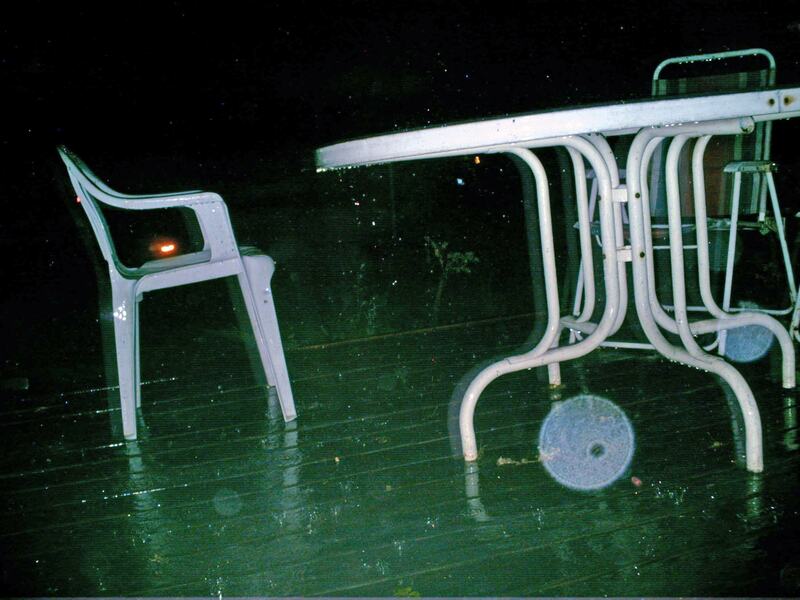 The photo of the two orbs under the table has had the "Fix Lighting" feature applied (below left). The photos below are enlargements. 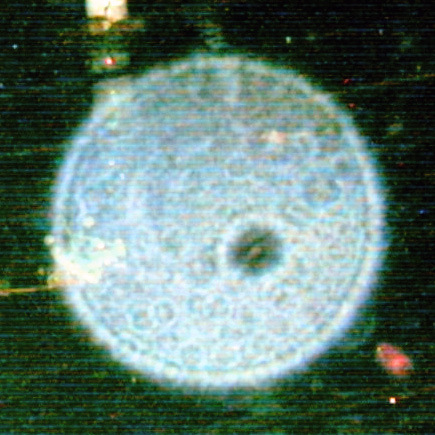 Orbs do indeed seem to have a certain form and structure to them. The photo enlargement squares on the right which look "purplish" are the color inverted versions. The orb at the bottom seems to have its "hole" facing perpendicular (purposely?) to the camera thus revealing a profile view and a "notch" where one of these "holes" (or dimples) would be. After having returned to Ohio in mid-2007, I had planned to go back to Nevada just as soon as I reasonably could and take up permanent residence there. I had hoped to return no later than Spring, 2008. Unfortunately, this did not work out. It would not be clear until Spring, 2009 that I would be able to affect this plan. I acquired the Fuji camera in April, 2009, during my time in Ohio. The particular "quirks" of the Fuji camera took some time to get used to. It is considerably more complex than the smaller Aiptek as it has an abundance of settings. I began to use it right away and I continued to capture the same ol' Spybees, orbs, and other paranormal things I had done previously with the Aiptek. When using the Fuji camera, the biggest difference is that the normally spherical orbs tend to come out as hexagons! I have come to suspect that this has something to do with the lens arrangement and the inter-dimensional nature of the orbs. In any case, if you happen to have an answer to this mystery I would sure appreciate hearing from you at ama11ory@gmx.com (there are two one's in that email addy). 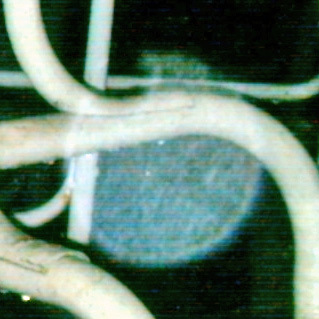 I have been getting the usual orbs in my room wherever that room might be (motel rooms also). I now have HUNDREDS of orb photos from taking shots just in whatever room I'm at. The only bad news is that most of them are quite dim. 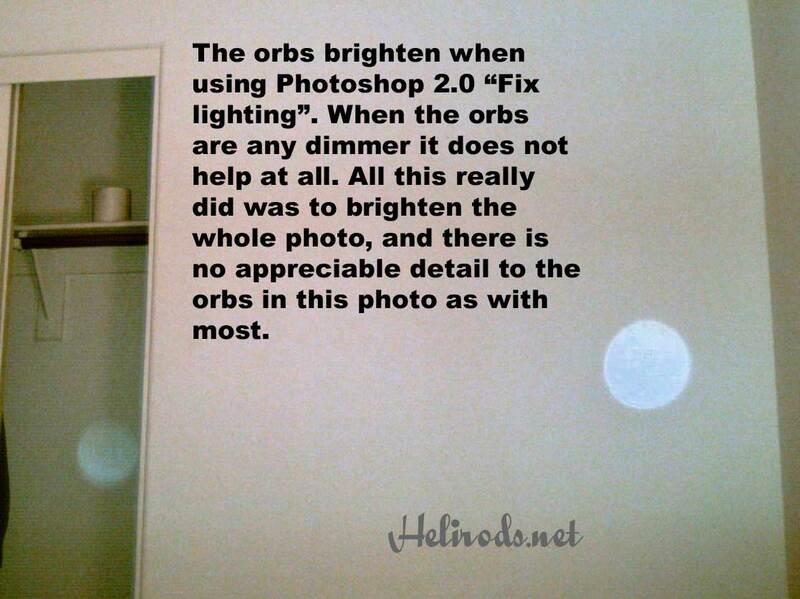 Nevertheless, I do have a good collection of bright room orbs which I will try to post at some time in the future. I have some photos of other similar things in "My former Las Vegas SE window view (2010-2011)" album in the Photo Gallery.